Guyana’s periodical press has survived through resilience and resourcefulness for over two centuries. This was so in part because Guyana’s polyglot population, most of whom are descendants of people who had been enslaved and brought to this country, or who came as indentured servants, yearned for the freedom of self-expression. Publications arose to express the people’s economic, ethnic, political, social, cultural and religious interests. Although usually short-lived, new periodicals continued to rise where the old ones had fallen thereby creating a continuous pattern of lively publication over the years. As everywhere else in the world, periodical magazines evolved alongside newspapers. Guyana’s first newspaper, the Courant van Essequebo en Demerary, appeared on 1 November 1793 in Stabroek, capital of the united colony of Essequebo and Demerary, but publication ceased after its first year. The Essequebo en Demerary Gazette, the first English language newspaper, made its appearance on 22 August 1796. This marked the start of continuous newspaper publication in the colony. The views of the European élite were propagated through organs such as the Royal Gazette, the Colonist and, later, the Argosy and the Chronicle in the early 19th century. Even European planters who enjoyed exclusive representation in the Court of Policy (the legislature) were often in conflict with the governor and his officials. Their acrimonious quarrels were candidly expressed in the press. As society became more diverse and relatively more liberal after the emancipation of Africans and the commencement of immigration of Asians in 1838, so did the press. Later, in the 19th and early 20th centuries, ethnic newspapers such as the African Freeman’s Sentinel, Portuguese A Liberdade and the Indian Indian Opinion, and working-class papers such as the Workingman and the Liberator led the struggle of non-European peoples to express their own opinions and to challenge the status quo. Indeed, the press heralded the struggles for constitutional reform in 1891, 1928 and 1952 in much the same way as it does today. The historical development of Guyanese periodicals was influenced by the same factors as the newspapers − economic, ethnic, constitutional, and technological. These were the consequence of the coexistence of a large African, Amerindian and Asian populace in a colony dominated by an élite class of mainly European government officials, traders, clergy and planters. These patterns made Guyanese publications seem particularly partisan, polemical and pugnacious, hardly ever national and rarely mainstream in character. These also triggered the surge in the printing of newspapers in the last quarter of the 19th century. But they tended to be rather short-sighted in outlook and short-lived in existence. Popular periodicals arose from time to time to express the opinion of special groups and to satisfy the appetite for entertainment of the general public. Covered and bound, magazines possess an appearance and semi-permanence which newspapers lack. Rarely published more frequently than weekly, magazines afford their editors and writers more time to investigate issues and, as a consequence, a better opportunity to interpret their significance. Most magazines in this country, unfortunately, managed only to print one or two issues and others appeared in fits and starts before vanishing completely. Indeed, among all the mass media, periodicals could be regarded as the most endangered species − the least likely to survive modernisation. Periodicals are a crucible for fresh ideas, insights and initiatives in popular culture. They do more than amuse the young and comfort the old; they encourage and inspire the talented and inculcate the shared values of nationhood. They also provide a forum for celebrating the country’s cosmopolitan cultures and common heritage, especially through the medium of art, folklore, literature and music. They are a living theatre in which people play their various roles and, at the same, time record their experiences for posterity. Fifty years ago in 1958, only thirteen periodical magazines were published in this country on a monthly, quarterly, semi-annual and annual basis. These were the Commercial Review, Guiana Diocesan Magazine, Guiana Times, Catholic Standard Magazine, Kyk-Over-Al, Farm Journal, Timehri, British Guiana Medical Annual, Police Magazine, Chronicle Christmas Annual, Bishops’ High School Journal, Queen’s College Annual and St. Stanislaus Magazine. Since that time, the quantity and diversity have increased. Appearing under various designations − annuals, digests, journals and reviews, for example − it is now possible to identify six types of periodicals in this country – family, literary, opinion, professional, social and Sunday supplement. At the peak of the popular periodical press was the ‘family’ magazine. This genre came to be typified by the Chronicle Christmas Annual that appeared in December 1915. It catered for wide interests by providing feature articles, short stories, arts, sports and music reviews, and photographic competitions. It was rivalled by similar annuals – Christmas Tide, published by the Argosy Company and Caribia, published by the British Guiana Lithographic Company. It was typical that the earliest family magazines were annuals published by the newspaper presses. Their relatively low cost (the first Chronicle Christmas Annual cost eight cents) and rich content made them both affordable and enjoyable. After several lapses in publication, the Guyana Annual resumed the tradition in 1998. Kyk-Over-Al, no doubt, was the most beloved ‘literary’ journal of all time although its circulation was always restricted to the colony’s literary élite. First published by the British Guiana Writers’ Association, it sold for one shilling and remained as the leading literary journal for over sixty years. It was the most important outlet for aspiring writers to publish their work largely under the tireless editorship of Arthur Seymour. Kaie, a government magazine which also became a useful medium of literary expression, appeared in 1965 but disappeared in 1985. The Arts Journal has now been established as the country’s premier literary periodical. Magazines of ‘opinion’ and news magazines closely followed the economic and social contours of society. One of the most controversial was the Guiana Times (also known as Times of Guiana), published, edited and written largely by Percy Armstrong. Appearing in 1947, the magazine adopted a fiercely anti-communist and, after the establishment of the People’s Progressive Party in 1950, anti-PPP stance. 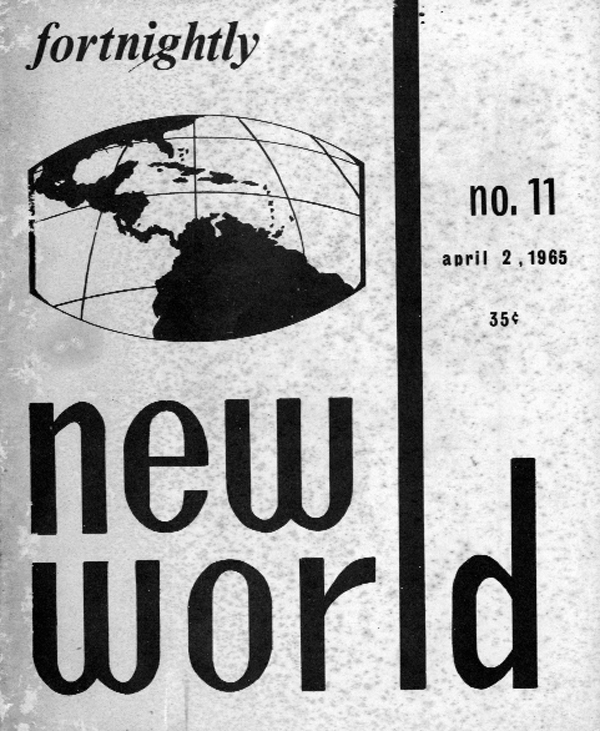 Other well-known news magazines were the New World Fortnightly which appeared in 1964 and published 50 issues, and the Guyana Review, which started in 1993 and published 168 monthly issues as an independent monthly magazine before it was absorbed by the Stabroek News newspaper. One of the earliest and finest ‘professional’ periodicals was Timehri, the journal of the Royal Agricultural and Commercial Society. It appeared in 1882 and survived for over a century. Timehri furnished a storehouse of information on almost every branch of scientific inquiry – anthropology, archaeology, agriculture, botany, commerce, culture, geography, geology, ethnicity, history and sociology. Its articles were written by leading officials in the government of the day, and others who were prominent in business, the professions and society. Through the efforts of the government, the Agricultural Journal of British Guiana (which was succeeded by The Farm Journal of Guyana) and the Guyana Journal of Public Administration, were among those produced to promote particular policies. The University of Guyana was the source of several serious journals – Guyana Historical Journal; Guyana Law Journal; Guyana Journal of Sociology and Transition – but their appearance was irregular. In the wider community, professional periodicals such as the Bar Association Review, the British Guiana Medical Annual; the Guyana Association of Professional Engineers Magazine; Commercial Review, Industrial Review, Guyana Business, and the Public Servant were published by various organisations, but infrequently. The Scarlet Beret and the Police Magazine were published by the Guyana Defence Force and the Guyana Police Force, respectively. Religious and racial interests, never been far from the surface, were the sources of some of the most popular ‘social’ periodicals. In particular, there has been a plethora of religious magazines. The Christian Catholic Standard Magazine and Guiana Diocesan Magazine and Gazette; the Hindu Aarya Marga and Sandeep and the Islamic Muslim Journal and Al Muallim are some of the better known. There have been several ethnic magazines such as the African Emancipation and the Indian Horizons; sporting magazines, such as Ajedrez, Bourda Beat and Sports Beat; and entertainment magazines such as Caribbean Entertainer and Guyana Entertainment Magazine – GEM. School magazines, particularly the long-established Queen’s College Annual (established in 1936) and the Bishops’ High School Journal set the standard for other high school publications. ‘Sunday supplement’ magazines, supplied by two of the newspapers, have posed a silent but surprisingly strong challenge to other periodicals. Weekend Magazine, distributed by the Sunday Stabroek, and Pepperpot, distributed by the Sunday Chronicle are available free of cost with the purchase of these newspapers but are not sold separately. Sunday supplements usually contain articles of good quality, photographs and other features especially consumer affairs, fashion, film, food, gardening, gender issues, health and tourism. ‘Nostalgia’ features are also always very popular. In terms of frequency of publication, quality and diversity of content and quantity of copies circulated, ‘Sunday supplements’ are the most popular periodicals in the country. Guyana’s periodicals have become compendiums of articles by various writers. Magazines (the word is derived from the Arabic makazin meaning storehouse) were less hasty and heterogeneous than daily newspaper but more timely and topical than books which, anyway, were difficult to produce in colonial Guyana with its small population and market. With their specialised content and appeal to richer people in society, magazines were able to occupy the middle ground between books and newspapers. Guyana’s periodicals have occupied a small and precarious place in the minds of the mass of people. But the mortality rate has been ruinous. Of over 150 magazines in Guyana’s press history, most perished as a result of insufficient funds and inadequate resources to maintain continuity. New opportunities in the fields of education, information, health, technology and travel bring new challenges to preserve the people’s identity and national integrity. Periodicals are well suited to contribute to the continuous task of extending the boundaries of knowledge, deepening the appreciation of the complexity of cultures and encouraging a shared vision of the country which ensures a good life for everyone.